YouTube has launched a new search-based targeting option on that combines the ability to select from the top 5% of channels and then target viewers who have also Googled relevant products. The new tool, part of the ‘Custom Intent Audiences’ suite, come as several additions to AdWords on Tuesday. The tool lets marketers target people on YouTube who recently searched for products and services on google.com. YouTube now allows brands to target ads to consumers based on anonymized information that Google collects on people across its network of sites. 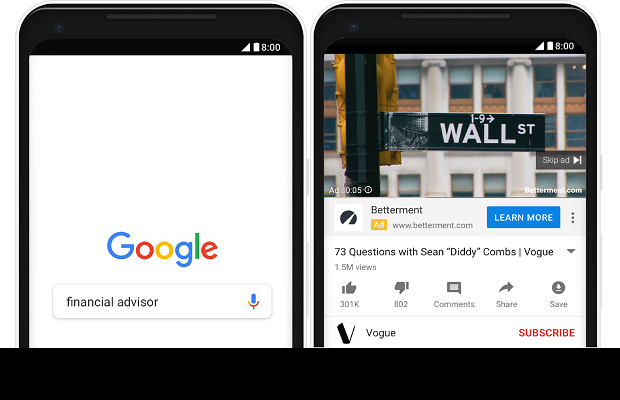 The video service has now added search-based targeting to its Google Preferred ad-buying program. Marketers at Delta Air Lines, for example, could reach people on YouTube who recently searched Google.com for “flights to Florida” by creating a keyword list for the video campaign in the new AdWords experience. This is one of several features announced by Google to drive demand through search and video. “Google is taking the best of what they do with search, with maps, with some of their apps, and they’re taking that data and applying it to their TV-like object, which is Google Preferred. It’s smart,” said Susan Schiekofer, GroupM chief digital investment officer. The agency’s clients have increased their spending on Google Preferred year over year, especially those clients targeting younger viewers, she said. By infusing its TV-style ad-buying program with audience-based targeting, YouTube could pre-empt its TV rivals who themselves want to use TV and audience targeting to overtake the digital media companies like Google and YouTube that had cut into their share of the advertising market. It could also undermine Facebook, which has recently begun pitching advertisers on its own version of Google Preferred. Along with Custom Intent Audiences, Google has rolled out TrueView for Action Ads, which allows advertisers to customize calls to action that appear along with their video ads on YouTube and are automatically set with Target CPA bidding. The ads can be skipped after five seconds, similar to TrueView in-stream ads.